"Like sands through the hourglass...so are the Days Of Our Lives." Although Days has aired since 1965, I only started watching it in the late 1980s early 1990s, when I was in high school. My friends and I would tape it on our VCRs, but I remember watching it the most everyday during summer break. It was a teenage thing. Of course, as life got busy with university and career, I had to stop watching the cast of crazies. So fast forward to summer 2008, and I just had my first baby and was on maternity leave. And looky, looky who I found lurking around on my TV. Is that YOU Sammy Brady? And how many kids do you have now? Seriously. And just like that, I was hooked again. It was like coming home, and catching up with everyone. Bo and Hope. Victor Kiriakis. The DiMeras and of course the evil Stefano. Sadly, the Horton's have always bored me even though they are the core family. There have been some recent appearances of some "old" characters, Jennifer, Kerri, Kayla, Adrienne, Justin and Carly. Haven't seen or heard anything about John/Roman and Marlena. And some days, I simply tune in to catch of glimpse of Brady Black... a little TV eye candy. Maybe I'll visit Salem, but until then I guess I'll keep watching (now I PVR rather than VCR), and follow some of the cast on Twitter. #DOOL. Days Of Our Lives is my favorite soap opera. What is yours? In high school and college, I always watched As the world turns and guiding light and sadly they are both gone. 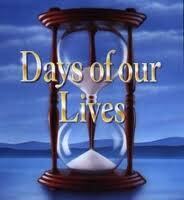 If there's a soap I'm going to watch, it's Days. The summer I was 13 I think I watched it every day! I always get a kick out of tuning in randomly, 16 years later, and still recognizing most characters. It's comforting in a really weird way!